The African Elephant is one of the most majestic creatures on planet Earth. With unmatched size and power, it is a truly unique terrestrial creature. 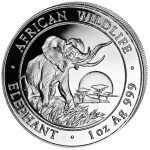 Native to the continent of Africa, the elephant is celebrated each year by the Bavarian State Mint on the African Wildlife Series. 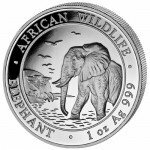 Now, you can purchase a 2007 1 oz Silver Somalian Elephant Coin from Silver.com in brilliant uncirculated condition. Coins listed in brilliant, uncirculated condition are free of all signs of wear and tear. The African Wildlife Series is designed to call attention to the plight of endangered animals on the continent. Prized for its ivory tusks, the elephant has stood on the brink of extinction for decades as mankind hunted the species aggressively. 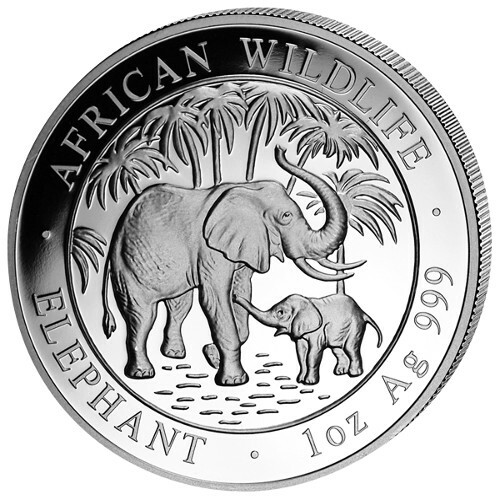 On the reverse side of the 2007 Silver Somalian Elephant Coin is the image of a mother elephant and her calf relaxing beneath trees on the savanna. 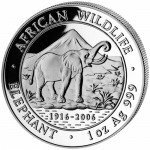 The image on the reverse side of Silver Somalian Elephant changes from one year to the next, making each coin unique in the series. The obverse side bears the same image from one year to the next. 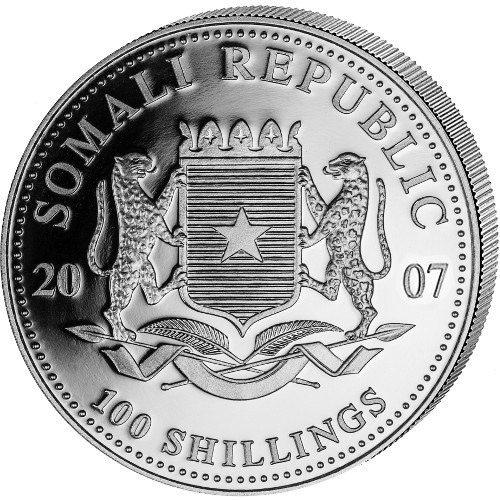 On this side, the coat of arms for the Republic of Somalia is featured in the center of the coin. Engravings around the outside read “Somali Republic,” the face value of the coin in Schillings, and the year of minting, which is split on either side of the coat of arms. 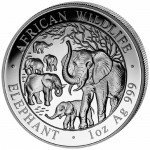 The state-owned Bavarian State Mint is located in Munich, Germany, and bears sole responsibility for producing the African Wildlife Series Coins. First opened in 1158, the Mint is an entity of the Free State of Bavaria and is one of the world’s oldest operating mint facilities. We encourage you to ask questions about all of our products. Silver.com associates are standing by to answer your questions via phone at 888-989-7223, or online through our live web chat and email services.